A replacement for the Phantom IV and Silver Wraith, the Phantom V assumed the mantle of Rolls-Royce flagship in Autumn 1959. Although, based on a derivative of the same 'Bentley 9' modular chassis that underpinned its lesser Rolls-Royce Silver Cloud II and Bentley S2 siblings, the newcomer boasted a substantially longer 145-inch wheelbase, wider track and extra reinforcement. A massive welded box-section, cruciform-braced affair, the structure in question was equipped with independent coil-and-wishbone front suspension, a 'live' leaf-sprung back axle, power steering and mechanical servo-assisted drum brakes. Propelled by a 6230cc OHV V8 engine allied to four-speed automatic transmission, the Phantom V employed a special 3.89:1 rear axle ratio that enabled it to amble along at walking pace for ceremonial duties and yet still accelerate through 100mph (if just barely). Available to coachbuilt special order only, the model was bodied by the likes of Hooper, James Young, Chapron, H.J. Mulliner, Park Ward and H.J. Mulliner Park Ward (the latter company being a Rolls-Royce created in-house amalgamation). Despite an eye-wateringly expensive price tag when new, the Phantom V proved a surprisingly strong seller throughout its production life. Upgraded for 1963 with a new quad headlamp visage and seven percent more horsepower, some 516 are thought to have been made by the time the Phantom VI usurped it five years later. Although more commonly associated with monarchs, heads of state and plutocrats, the uber Rolls-Royce was associated with at least one anti-establishment figure - John Lennon. Finished in Maroon with a black roof covering and Valentine's Burgundy upholstery, this particular example wears Enclosed Limousine coachwork by H.J. Mulliner Park Ward. Supplied new via Jack Barclay Ltd to Mrs G.E. Davis of Gedma Investments Ltd, its factory guarantee was issued on 29th March 1965. No doubt conscious that the car would be used for numerous long journeys, Mrs Davis specified the following extras: rear squab top bolster one-inch deeper than standard, special modified central rear armrest with hinged lid, compact, notebook / pencil, cigarette case, cocktail cabinet (two decanters, four glasses, one bottle opener, two hand cushions), electric windows to all doors, special rear footrests and an electric aerial. As well as the expected Phantom V accoutrements such as foldout occasional seats and a glass division, chassis number '5VD51' boasts opening rear quarter lights and four pull-out armrests to its front bench seat. Bequeathed by Mrs Davis to her sibling P.J. Binns in 1995, the Rolls-Royce entered the current ownership some twelve years ago (though, Mrs Davis is the only former keeper shown on the V5C registration document). 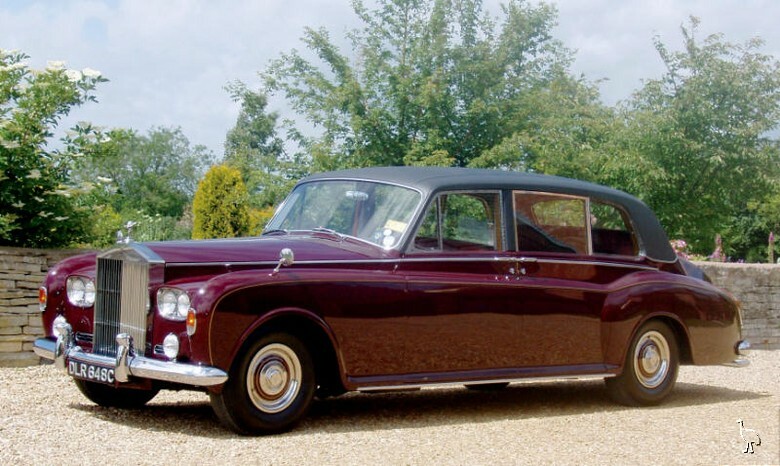 Among the sundry paperwork that accompanied the limousine was a chauffeur's hand-written logbook with entries stretching from 4th November 1968 (26,929 recorded miles) to 3rd February 1982 (75,707 recorded miles). Apart from revealing that the car was principally maintained by the chauffeur and local dealer Caffyns of Eastbourne (aside from the occasional visit to Rolls-Royce's Cricklewood service depot), it showed just how far the Phantom V ventured. Beyond the frequent trips to Brighton and London that a wealthy Sussex resident might have been expected to make are notes detailing repeat excursions to Harrogate, Leeds, Stamford, Bury, Oldham, Honiton and Taunton etc. Whether travelling for business or pleasure, chassis '5VD51' certainly served up first class comfort; a little bit like having one's own cabin on the Orient Express. However, by the time the vendor acquired it the car was looking somewhat forlorn. Undaunted he embarked upon a sympathetic restoration programme that saw particular attention paid to the chassis (new sills, step boxes etc), brake pipes, steering hoses, engine bay and paintwork. Pleasingly retaining its original upholstery, the Phantom V has spent the last ten years being shown at various rallies and concours events. Awarded the North of England Lancaster Trophy in 1999, it won its class at the RREC's Annual Rally some two seasons later. Judged second in class at the RREC's Kelmarsh Hall meeting just last month, chassis '5VD51' performed well on a recent test drive.